GKN’s Patent No. 8,215,440 covers a 2wd/4wd dual drivetrain. 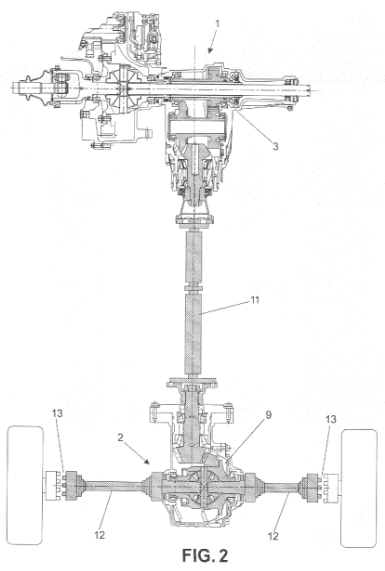 This general type of drivetrain was already well known in the automotive industry — and the claims of the patent appear to my eyes to be quite broadly written. On appeal the Federal Circuit has refused to hear the case — finding that the case lacked Constitutional standing since JTEKT had not alleged any “actual injury.” The case here follows Phigenix, Inc. v. Immunogen, Inc., 845 F.3d 1168 (Fed. Cir. 2017). In that case the patent challenger Phigenix was not planning to actually use the Immunogen patent, but argued its injury was based upon the competitive advantage that the patent gave to its owner. Although that injury might be sufficient for standing purposes — the Federal Circuit still dismissed the case because Phigenix failed to present sufficient facts to make the injury plausible. Standing is an oddball with IPRs. Anyone can file an IPR request and the USPTO will consider that request. The Patent Act directly states that a losing petitioner has a right to appeal if it loses the IPR. (A party “who is dissatisfied with the final written decision of the Patent Trial and Appeal Board . . . may appeal the Board’s decision . . . to the United States Court of Appeals for the Federal Circuit.” 35 U.S.C. § 141(c).) Still, the Supreme Court has repeatedly held that the Constitution requires an actual controversy between the parties — and that the Article III courts cannot offer advisory opinions. A particular element in question for appellate IPR standing is injury-in-fact — “an injury that is both ‘concrete and particularized.’” Spokeo, Inc. v. Robins, 136 S. Ct. 1540 (2016)(non-IPR case). While JTEKT has submitted two declarations in support of its standing, JTEKT’s problem is that these declarations do not establish that its planned product would create a substantial risk of infringing [the particular claims on appeal] or likely lead to charges of infringement. Note here – Folks interested in this issue should consider the pending Supreme Court petition in RPX Corporation v. ChanBond LLC (SCT Docket No. 17-2346). The Federal Circuit’s decision here is utterly misguided and wrong. They are conflating (a) bare constitutional Article III standing to appeal an adverse decision with (b) the separate standard for bringing a declaratory judgment action in district court to invalidate the patent. JTEKT clearly would not have been able to bring a DJ action under the facts here. They instead brought an IPR proceeding before the PTAB, which does not require Article III standing. JTEKT lost, and that loss has significant consequences–they are estopped from ever challenging the patent in court in any ground they raised or reasonably could have raised in the IPR. At the point in time when JTEKT attempted to invoke Article III jurisdiction–on appeal–JTEKT had already suffered a palpable and significant change in its legal status as a result of losing the PTAB proceeding. Their legal rights have been diminished in that their defenses to a cause of action have been reduced. That diminution clearly concrete, particularized, and more than sufficient to show an “injury in fact” under Article III. Whether or not they are likely to infringe the patent goes more to a question of mootness, or ripeness, not whether or not there’s an injury in fact in the first instance (and there clearly was here). The rationale for saying that estoppel consequences of the AIA aren’t a sufficient “injury in fact” to appeal an adverse decision, simply put, is questionable. [T]hey are estopped from ever challenging the patent in court in any ground they raised or reasonably could have raised in the IPR. And? How likely are they ever to end up in a court, trying to raise such an argument? On this record, that is quite speculative. “I am estopped from exercising a right that I may never exercise in any event” seems rather a poor foundation on which to ground a “case or controversy” to satisfy Art. III. Correct – and as I have explained, Congress cannot “manufacture” true Article III standing by creating a hybrid process in multiple-fora in which a first part of the process LACKS Article III standing and a second part “magically” makes such Article III standing disappear by virtue of the first part of the process. Your attempt here at “palpable legal injury” has already been adjudicated and that line of reasoning denied. From you, that’s error enough. Martin, that is the argument in the cert petition in RPX Corporation v. ChanBond LLC (SCT Docket No. 17-2346) cited by Dennis above. That argument in the cert petition is fa tally flawed. Further, the court submission lacks an acknowledgment of currently controlling law that speaks to the opposite of what the document contends the law to be (and I just saw a legal ethics article that would have absolutely hammered the attorneys for submitting such a brief. It is one thing to argue for a change in law and it is quite another to argue that the law is something that it is not. Does anyone believe that “anon” gives a shirt about the glorious sanctitude of the U.S. Constitution? If so, I have a bridge to sell you. Your mindless attempt at ad hominem misses – and misses badly. Maybe if you had some (read that as ANY) reason why my posts concerning proper application of the US Constitution should or even could be questioned, then maybe your post would not come off as such a feeble attempt to discredit the actual legal points to which my posts provide. But we both know that your “contributions” simply do not provide anything remotely close to that. So contribute something on point and please stop being such an immense bore, Malcolm. Except administrative “courts” are not “inferior Courts” by the Constitution for lots of reasons including that they are controlled by the President. I think you meant “in addition” rather than “Except” as to the absence of a “case or controversy” requirement. Not sure what your point is, Paul. It seems like a vacuous snipe from the sidelines and is rather untethered to the distinction (all too real) between Article III standing and the “sham” of mixed fora and sliding into the Article III forum based on a proceeding in a non-Article III forum. If you want to try to make a more direct and cogent point, you will have to do better than merely point out that Congress can create an Article III court. There is a world of difference between creating such a court and the necessary Constitutional aspect of case or controversy to be in any such created court. There is no Constitutional “case or controversy” requirement for any courts other than Federal courts which are Article III courts. Many state Supreme Courts can even give purely advisory opinions. Great Paul – and how is that observation connected to the issue at point here? Maybe you are done trying to kick up dust here? JTEKT’s problem is that these declarations do not establish that its planned product would create a substantial risk of infringing [the particular claims on appeal] or likely lead to charges of infringement. Sounds too subjective to be a legal standard: You say you are going to infringe, but meh, we think its ‘likely’ you don’t get sued. PTAB anomaly #8 or 9? – in certain scenarios CAFC will has jurisdiction over a patent on review of a trial court record, such as a Hatch-Waxman action, but CAFC, will not have jurisdiction over a PTAB order on that same patent rendering the PTAB advisory and unreviewable but still having an offensive impact in a court of record. Got it. In other words, if the King’s privy court grant’s the patent owner the blessing of the patent claims, the Art III appeals court cannot review that order, unless a subjective standard is applied that the losing party is ‘likely’ to be sued. Did I get that right? I miss Ned. This rarity of appeal dismissals for lack of Article III standing for a Fed. Cir. appeal of an IPR decision is another demonstration of how infrequently are there petitioners like JTEKT willing to spend the money and take the estoppel risks to pursue IPRs if they are not actually being sued or threatened with suit. Petitioners like JTEKT could file ex-parte reexaminations. That would save them money too. I don’t get why they pick IPR over ex-parte reexaminations. Anyone has an explanation? I think that you are correct that they might have been better advised to have filed this as an EPR instead of an IPR. That said, if I had to hypothesize a reason why they might have reasonably chosen to file the IPR instead of the EPR, I believe (although I cannot find the source for this contention) that the rate of IPR institution is much higher than the rate for EPR institution. In other words, if I am correct about that supposition, they may have figured that their chances of getting the PTO to adjudicate their proposed grounds of invalidity was higher through the IPR route than the EPR route. Well, scratch that one. It turns out that EPRs actually have a higher rate of institution than IPRs. Maybe they wanted to challenge the patent based on art that had already been considered by the examiner, so they thought that they could make a care for “more likely than not invalid,” but not a case for “substantial new question of patentability”? Because ex parte reexamination is simply terrible as a means of invalidating patents. As its name implies, the third party requester has absolutely no say in the proceeding after the request is filed. The patent owner can make whatever arguments it wants, request examiner interviews, amend and add claims without the limitations of the IPR procedure, etc., and the original requester cannot respond or call b.s. on anything the patent owner does. This is why ex parte reexamination always had a higher rate of claim confirmation when compared to inter partes reexamination when it existed. So if you have good art, you’re better off holding it in your pocket in the event you get sued. If you disclose it in ex parte reexamination, the chances are high the claims will be confirmed and your art will be effectively lost forever. Thanks. That is helpful. I think that the take-away here is that the IPR petitioner is in exactly the same position now as they would have been had they submitted this art for an ex parte re-exam request. Just like the ex parte requester, they should have kept the art in their pocket, rather than requesting IPR at a stage in the game at which they lacked standing to appeal a loss in front of the PTAB. Yes LR. ex parte reexamination is stacked against the adverse petitioner, and usually slower. Especially if the petition does not have airtight declarations and clear prior art. But EPRs [and reissues] now goes to different examiners, in a different PTO unit, the CRU, which no longer has as big a backlog. But as for “holding prior art in your pocket until sued,” that does not make good sense to many clients these days. Roughly 90% of lawsuit defendants these days will pay a substantial settlement rather than pay all the costs of patent litigation and appeals. In that case their “saved” validity defenses never get used. Also, validity challenges that go all the way to a jury trial and appeal are much less successful on average and vastly more expensive than a reexamination. Presenting the prior art to the patent owner with a threat of an IPR to lower the price of a license in a pre-suit licensing negotiation is another and possibly better alternative. Another advantage of not “holding prior art in your pocket until sued” is that if the disclosed prior art is good enough, and the patent owner proceeds with a suit without any opinion or other valid basis, the patent owner may even be setting itself up for attorney fee sanctions. PTAB anomaly #8 or 9? – in certain scenarios CAFC will… not have jurisdiction over a PTAB order… rendering the PTAB advisory and unreviewable but still having an offensive impact in a court of record. (1) In what sense is the PTAB holding “advisory” in these cases? (2) How is this an “anomaly”? If the Hatch-Waxman defendant—in the pre-AIA world—were to have filed an ex parte re-exam request, then the ex parte requester might well have an interest in the re-exam outcome, but no standing to take appeal to the CAFC if the re-exam did not turn out the way that the requester wanted. Exact same thing here. How is that outcome “anomalous”? It would be anomalous IF Article III standing were to magically appear. An IPR decision that cannot be appealed is a final decision, so why would not the normal IPR statutory certificate removing IPR rejected claims from the patent issue? That is not advisory. Per your note here, RPX, Askeladden and the NYIPLA have some interesting “real party” conflicts. As for the differences in standing, the lack of ability to “artificially” legislate Article III standing and the truly “oddball” nature of the AIA’s dual Article III/non-Article III process, past dialogue between myself and the late Ned Heller greatly informs the (necessary) understanding.